Psychostimulants and other drugs of abuse activate extracellular signal-regulated kinase (ERK) in the striatum, through combined stimulation of dopamine D1 receptors (D1Rs) and glutamate NMDA receptors. Antipsychotic drugs activate similar signaling proteins in the striatum by blocking dopamine D2 receptors (D2Rs). However, the neurons in which these pathways are activated by psychotropic drugs are not precisely identified. We used transgenic mice, in which enhanced green fluorescent protein (EGFP) expression was driven by D1R promoter (drd1a-EGFP) or D2R promoter (drd2-EGFP). We confirmed the expression of drd1a-EGFP in striatonigral and drd2-EGFP in striatopallidal neurons. Drd2-EGFP was also expressed in cholinergic interneurons, whereas no expression of either promoter was detected in GABAergic interneurons. Acute cocaine treatment increased phosphorylation of ERK and its direct or indirect nuclear targets, mitogen- and stress-activated kinase-1 (MSK1) and histone H3, exclusively in D1R-expressing output neurons in the dorsal striatum and nucleus accumbens. Cocaine-induced expression of c-Fos and Zif268 predominated in D1R-expressing neurons but was also observed in D2R-expressing neurons. One week after repeated cocaine administration, cocaine-induced signaling responses were decreased, with the exception of enhanced ERK phosphorylation in dorsal striatum. The responses remained confined to D1R neurons. 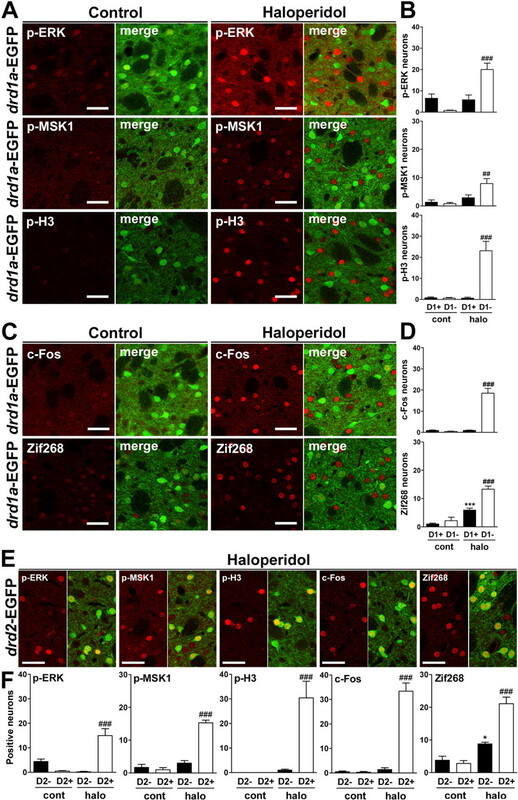 In contrast, acute haloperidol injection activated phosphorylation of ERK, MSK1, and H3 only in D2R neurons and induced c-fos and zif268 predominantly in these neurons. Our results demonstrate that cocaine and haloperidol specifically activate signaling pathways in two completely segregated populations of striatal output neurons, providing direct evidence for the selective mechanisms by which these drugs exert their long-term effects. The basal ganglia are involved in the selection and execution of action, through interactions with multiple brain areas that process sensorimotor, emotional, and cognitive information (Groenewegen, 2003; Gurney et al., 2004). The major entry structure of the basal ganglia is the striatum, mostly composed of GABAergic medium-size spiny neurons (MSNs). MSNs receive glutamate inputs from the cerebral cortex and thalamus and a dopamine (DA) innervation from the midbrain. DA modulates the flow of information through the striatum and the plasticity of corticostriatal synapses. MSNs belong to two intermingled neuronal populations distinguished on the basis of their projections and expression of distinct sets of proteins. MSNs projecting to the substantia nigra pars reticulata (SNr) and medial globus pallidus (entopeduncular nucleus) express mostly dynorphin, substance P, and dopamine D1 receptors (D1Rs), whereas MSNs projecting to the lateral globus pallidus (LGP) express preferentially enkephalin, dopamine D2 receptor (D2R), and adenosine A2a receptors (Gerfen et al., 1990; Fink et al., 1992; Le Moine and Bloch, 1995). These two populations of neurons are thought to participate in distinct, direct and indirect, circuits with opposing functional properties (Alexander et al., 1986). However, the degree of segregation between these circuits has been much debated because they are difficult to identify. Several lines of evidence underline the importance of the extracellular signal-regulated kinase (ERK)/mitogen-activated protein kinase (MAPK) pathway in the striatum. Administration of various drugs of abuse activates ERK in the striatum through combined stimulation of D1R and NMDA receptor (Valjent et al., 2000, 2004, 2005; Salzmann et al., 2006). ERK activation participates in long-lasting behavioral effects of drugs of abuse (Girault et al., 2007). Some ERK targets in response to cocaine have been identified, including phosphorylation of nuclear mitogen- and stress-activated kinase-1 (MSK1) and histone H3 and expression of immediate-early genes (IEGs) c-fos and zif268 (Valjent et al., 2000; Brami-Cherrier et al., 2005). In DA-depleted striatum, stimulation of D1R activates ERK, which is linked to the development of dyskinesia (Gerfen et al., 2002; Pavon et al., 2006; Santini et al., 2007; Westin et al., 2007). Cortico-striatal stimulation also activates ERK in the dorsolateral striatum (Sgambato et al., 1998; Gerfen et al., 2002), partly by activating A2a receptors (Quiroz et al., 2006). In contrast, antipsychotic drugs, which are antagonists at D2-like receptors, activate ERK in the striatum through an unknown mechanism (Pozzi et al., 2003; Hakansson et al., 2004; Valjent et al., 2004). The available evidence suggests that drugs of abuse, such as cocaine, and classic antipsychotic drugs, such as haloperidol, may be acting on different populations of striatal neurons. To directly test this hypothesis, we investigated the effects of cocaine and haloperidol in drd1a- and drd2-EGFP transgenic mice, which allow the identification of striatonigral and striatopallidal MSNs (Gong et al., 2003). After a precise characterization of enhanced green fluorescent protein (EGFP)-expressing neurons, we showed a complete segregation of neuronal populations in which signaling pathways are activated in response to single or repeated exposures to cocaine or after haloperidol administration. Swiss-Webster mice carrying drd1a-EGFP or drd2-EGFP bacterial artificial chromosome (BAC) transgenes were generated by the GENSAT (Gene Expression Nervous System Atlas) program at Rockefeller University (New York, NY) (Gong et al., 2003). Male 7- to 8-week-old mice were used for this study and maintained in a 12 h light/dark cycle, in stable conditions of temperature (22°C) and humidity (60%), with food and water ad libitum. All experiments were in accordance with the guidelines of the French Agriculture and Forestry Ministry for handling animals (decree 87849, license A75-05-22). Cocaine-HCl (20 and 30 mg/kg as salt; Cooper) was dissolved in 0.9% (w/v) NaCl (saline). Haloperidol (0.5 and 1 mg/kg; Sigma) was dissolved in saline containing 5% acetic acid, and the pH was adjusted to 6.0 with 1 m NaOH. Drugs were administrated intraperitoneally. Acute effects of cocaine were measured in cylindrical locomotor activity boxes (Imetronics). Mice were habituated to the test apparatus, handling, and procedure for 2 h for 3 consecutive days before the actual experiment. In these habituation sessions, mice received three saline injections: just before being placed in the apparatus, and 60 and 120 min after. The acute locomotor effects of cocaine were evaluated. On day 4, mice locomotor activity was recorded at 60 min before (spontaneous activity) and during different time periods (0, 2, 15, 30, and 60 min) after cocaine (20 or 30 mg/kg, i.p., as indicated) injection, at the end of which animals were perfused as described below. Mice were habituated to locomotor activity boxes, as described above, for 2 d and treated daily with cocaine (20 mg/kg, i.p.) for 5 consecutive days. Repeated exposure was followed by 6 d of withdrawal and, on day 14, by a challenge injection of saline or cocaine (20 mg/kg). A group of control mice was treated in similar conditions, except that they received repeated saline injections instead of cocaine. Locomotor activity was measured 60 min before and after cocaine injection on days 3–7. On day 14, locomotor activity after cocaine administration was recorded before perfusion at the indicated times, as described below. Sensitization was expressed as [(mean response to cocaine in cocaine-pretreated mice) − (mean response to saline in cocaine-pretreated mice)] ÷ [(mean response to the first injection of cocaine) − (mean acute response to saline)] × 100. Effects of single exposure to haloperidol were evaluated in the home cage. Mice were habituated to handling and saline injection for 3 consecutive days before the actual experiment. Haloperidol (0.5 or 1 mg/kg, i.p., as indicated) was administered on day 4, and mice were perfused as described below 15 or 60 min after injection. Mice were rapidly anesthetized with pentobarbital (30 mg/kg, i.p. ; Sanofi-Aventis) and perfused transcardially with 4% (w/v) paraformaldehyde in 0.1 m sodium phosphate buffer, pH 7.5. Brains were postfixed overnight in the same solution and stored at 4°C. Thirty-micrometer-thick sections were cut with a Vibratome (Leica) and stored at −20°C in a solution containing 30% (v/v) ethylene glycol, 30% (v/v) glycerol, and 0.1 m sodium phosphate buffer, until they were processed for immunofluorescence. Brain regions were identified using a mouse brain atlas (Paxinos and Franklin, 2001), and sections equivalent to the following bregma coordinates were taken (in mm): 1.54, rostral nucleus accumbens (NAc); 1.18, medial NAc and dorsal striatum; 0.86, caudal NAc; −0.58, globus pallidus; −3.08, ventral tegmental area (VTA) and substantia nigra. Sections were processed as follows. Free-floating sections were rinsed in Tris-buffered saline (TBS; 0.25 m Tris and 0.5 m NaCl, pH 7.5), incubated for 5 min in TBS containing 3% H2O2 and 10% methanol, and rinsed three times for 10 min each in TBS. After a 20 min incubation in 0.2% Triton X-100 in TBS, sections were rinsed three times in TBS again. Finally, they were incubated overnight at 4°C with the different primary antibodies. For detection of phosphorylated proteins, 0.1 mm NaF was included in all buffers and incubation solutions. In the experiments for characterizing EGFP-expressing neurons, monoclonal antibodies against D1Rs (1:1000; gift from R. R. Luedtke, University of North Texas Health Science Center at Fort Worth, Fort Worth, TX) and DA- and cAMP-regulated phosphoprotein Mr ∼32,000 (DARPP-32; 1:1000; gift from P. Greengard, Rockefeller University, New York, NY) were used, as well as rabbit polyclonal antibodies against Gαolf protein (1:500) (Hervé et al., 2001), parvalbumin (1:2000; Swant), calretinin (1:2000; Swant), and choline acetyltransferase (ChAT; 1:2000; Millipore Bioscience Research Reagents). Rat polyclonal antibodies against somatostatin (1:2000; Millipore) were also used. In the experiments with drugs, phosphorylation of several proteins was analyzed using rabbit polyclonal antibodies against diphospho-Thr-202/Tyr-204-ERK1/2 (1:400; Cell Signaling Technology), phospho-Thr-581-MSK1 (1:750; Cell Signaling Technology), and phospho-Ser-10-H3 (1:500; Upstate Biotechnology). A mouse monoclonal antibody against diphospho-Thr-202/Tyr-204-ERK1/2 (1:400; Promega) was used for some double-labeling experiments. Expression of IEGs was analyzed using rabbit polyclonal antibodies against c-Fos (1:1000; Santa Cruz Biotechnology) and Zif268 (1:800; Santa Cruz Biotechnology). Sections were rinsed three times for 10 min in TBS and incubated for 45 min with goat Cy3-coupled (1:400; The Jackson Laboratory) and/or goat A633 (1:400; Invitrogen) secondary antibodies. Sections were rinsed for 10 min twice in TBS and twice in Tris buffer (0.25 m Tris) before mounting in Vectashield (Vector Laboratories). Confocal microscopy and image analysis were performed at the Institut du Fer à Moulin Imaging Facility. Double- and triple-labeled images from each region of interest (ROI) were obtained bilaterally using sequential laser-scanning confocal microscopy (SP2; Leica). In the analysis of fluorescence colocalization, two-dimensional (2D) cytofluorograms were plotted from 375 × 375 μm red and green images using the Leica LCS program. A 2D cytofluorogram is a dot diagram that visualizes the joint distribution of intensity values of two detection channels (red and green). Each dot of the scatter plot represents an intensity value pair from the two detection channels. Neuronal quantification was performed in 375 × 375 μm images by counting nuclear EGFP fluorescence (for assessment of D1R- and D2R-positive cells) and nuclear Cy3 immunofluorescence (for each marker analyzed). Cell counts were done by an observer unaware of the treatment received by the mice. A total of 76 animals was used in this study: 4 mice to characterize the EGFP expression pattern in the transgenic strains, 23 mice for the 20 mg/kg acute cocaine experiment (three to four animals per time-point group), 4 mice for the 30 mg/kg acute cocaine experiment, 24 mice for the chronic cocaine experiment (four to seven animals per group), 17 mice for the 0.5 mg/kg haloperidol experiment (three to eight animals per group), and 4 mice for the 1 mg/kg haloperidol experiment. Data were analyzed using two-way (supplemental Tables 1, 2, 4, 6, 7, available at www.jneurosci.org as supplemental material) or three-way (supplemental Table 5, available at www.jneurosci.org as supplemental material) ANOVA as required by the number of independent variables. Post hoc comparisons between groups were made using the Bonferroni test. In the time-course study, data analysis was performed using one-way ANOVA (supplemental Table 3, available at www.jneurosci.org as supplemental material) followed by the post hoc Dunnett's multiple comparisons test. In all cases, the significance threshold was set at p < 0.05. The transgenic mice we used carry BACs that express EGFP under the control of cell-type-specific regulatory elements of D1R (drd1a-EGFP mice) or D2R (drd2-EGFP mice) promoter (Gong et al., 2003). We first verified that the EGFP-labeled neuronal projections matched with the established circuitry of the basal ganglia. Strong labeling corresponding to striatonigral terminals was observed in the SNr of drd1a-EGFP mice (Fig. 1Aa,Ab), whereas no fluorescent terminals were seen in drd2-EGFP mice (Fig. 1Aa′,Ab′). In contrast, cell bodies, presumably corresponding to DA neurons that express D2 autoreceptors, were exclusively visualized in the substantia nigra pars compacta (SNc) and the VTA of drd2-EGFP mice (Fig. 1Aa′,Ab′). In contrast, striatopallidal terminals that define the indirect pathway were virtually not visible in drd1a-EGFP mice (Fig. 1Ac,Ad), whereas they were intensely stained in the LGP of drd2-EGFP mice (Fig. 1Ac′,Ad′). EGFP expression in BAC transgenic mice allows a clear distinction between D1R-striatonigral and D2R-striatopallidal neurons. A, Fluorescent axonal projections were found in the substantia nigra in drd1a-EGFP mice (a, b) and in the LGP in drd2-EGFP mice (c′, d′). Higher-magnification images are shown in b, b′, d, and d′. Neurons labeled in SNc and VTA of drd2-EGFP mice are likely to be DA neurons that contain D2 autoreceptors (a′, b′). Scale bars: a, c, a′, c′, 200 μm; b, d, b′, d′, 40 μm. B, C, Striatal sections from drd1a-EGFP and drd2-EGFP mice (Ba, Ba′, Ca, Ca′) are stained with antibodies for D1R (Bb, Bb′) and Gαolf (Cb, Cb′). A 2D cytofluorogram is plotted for each double-stained image (Bc, Bc′, Cc, Cc′), in which the region of interaction between the red channel (y-axis) and the green channel (x-axis) is displayed in blue (area of colocalization). The set of value pairs selected in the area of colocalization (ROI) are highlighted in white in the original image (Bd, Bd′, Cd, Cd′). Note the EGFP colocalization with D1R only in drd1a-EGFP mice (Bd, Bd′) and with Gαolf in both mouse strains (Cd, Cd′). Scale bars, 40 μm. Images are laser-scanning confocal microscope stacked sections (A) and single optical sections (B, C). DStr, Dorsal striatum; col, colocalization. We then studied the expression of EGFP in striatal MSNs. Although the analysis of endogenous EGFP fluorescence in drd1a-EGFP and drd2-EGFP mice showed equivalent amounts of labeled neurons (Fig. 1Ba,Ba′,Ca,Ca′), colabeling with specific markers revealed that the two neural populations were segregated. Immunofluorescence using D1R antibody, which specifically labeled the dendrites of D1R-expressing neurons, showed a colocalization with EGFP staining in the neuropil of drd1a-EGFP mice but not of drd2-EGFP mice (Fig. 1Bb,Bb′). To study colocalization, a cytofluorogram was plotted for each image, and an equivalent region of the scatter plot was selected in both graphs (Fig. 1Bc,Bc′). When image points selected for colocalization (ROI) in the cytofluorogram were highlighted in white in the original image, high levels of punctuate colocalization between EGFP and D1R were detected in the neuropil of drd1a-EGFP mice but not of drd2-EGFP mice (Fig. 1Bd,Bd′). In contrast, when immunofluorescence analysis was performed using an antibody against Gαolf, a striatal-enriched G-protein present in all MSNs that is coupled to the D1Rs (in D1R-expressing neurons) and to the adenosine A2a receptors (in D2R-expressing neurons), a very high colocalization was observed in the neuropil for both mouse strains (Fig. 1C). MSNs account for >95% of the striatal neurons in rodents (Tepper and Bolam, 2004). The rest of the neurons are interneurons that can be identified on the basis of their morphology, their neurochemistry, and their electrophysiological properties as large aspiny cholinergic neurons and at least three distinct types of GABAergic interneurons (Kawaguchi et al., 1995; Tepper and Bolam, 2004). Although cholinergic interneurons express D2R, little is known about the expression of D1R and D2R in GABAergic interneurons. To clarify this point, we used DARPP-32 antibody, a marker of MSNs (Ouimet et al., 1984), and antibodies to parvalbumin, calretinin, and somatostatin to label the various types of GABAergic interneurons (Kawaguchi et al., 1995) (Fig. 2). As revealed by triple-fluorescence analysis, none of the three markers of GABAergic interneurons colocalized with DARPP-32 or EGFP in the striatum of drd1a- and drd2-EGFP mice (Fig. 2). These results demonstrated (1) that DARPP-32 specifically labels striatal MSNs and (2) that GABAergic interneurons do not express D1R or D2R. EGFP and DARPP-32 are not expressed in GABAergic interneurons in drd1a- and drd2-EGFP mice. Parvalbumin (parvalb; A), calretinin (calret; B), and somatostatin (somatost; C) immunoreactivity (red) was detected together with EGFP (green) and DARPP-32 (blue) immunoreactivity in the striatum of drd1a-EGFP (top) and drd2-EGFP (bottom) mice in a triple fluorescence analysis (insets, higher magnification). Arrowheads indicate the position of GABAergic interneurons. Merged images show that GABAergic interneurons do not express EGFP or DARPP-32. Single confocal sections are shown. Scale bars, 40 μm. Some controversy remains about the proportion of MSNs expressing D1R, D2R, or both receptors (Le Moine and Bloch, 1995; Yung et al., 1995; Surmeier et al., 1996). We identified DARPP-32-positive MSNs in drd1a-EGFP and drd2-EGFP mice (Fig. 3A), and, for each region, the percentage of EGFP-positive neurons was measured in DARPP-32-immunolabeled cells. Although these numbers were obtained in different mice, they provide interesting estimates of striatal neuronal populations. The summed percentages of D1R- and D2R-EGFP exceeded 100%, indicating that at least some MSNs expressed both receptors. The minimal estimated proportion of neurons expressing both types of receptors was higher in the NAc shell than in the dorsal striatum or the NAc core (17% vs 5–6%) (Fig. 3B). Assuming that all MSNs express either D1R or D2R, we also estimated the proportions of MSNs likely to express only one of these receptors, and found them to be similar in all striatal regions (47–53% D1R; 36–43% D2R) (Fig. 3B). All EGFP-positive neurons were DARPP-32 immunoreactive in drd1a-EGFP mice, whereas a few EGFP-positive neurons were negative for DARPP-32 in drd2-EGFP mice (data not shown). This subset of EGFP-positive cells represented 2.2 ± 0.5% of drd2-EGFP-expressing striatal cells and were, in many cases, larger than MSNs. 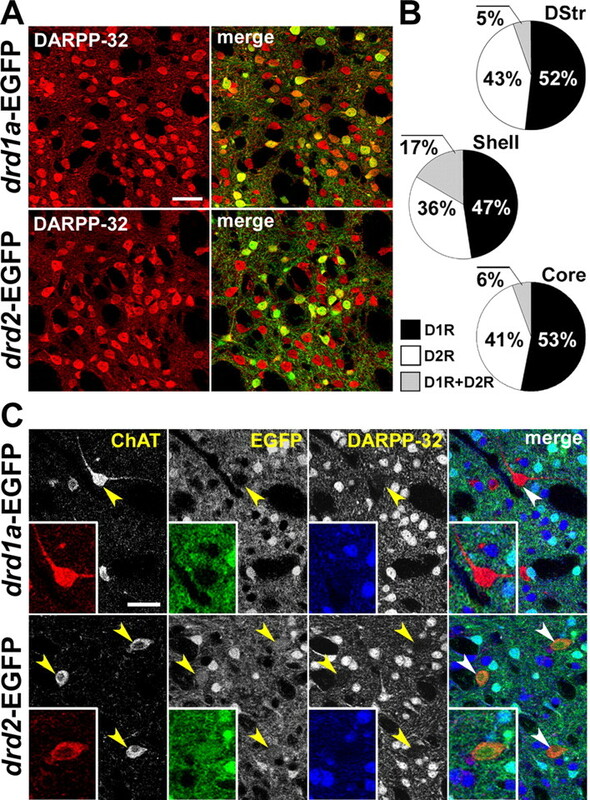 Double-immunofluorescence analysis of ChAT and DARPP-32 in drd1a-EGFP and drd2-EGFP mice showed that these neurons were cholinergic interneurons (Fig. 3C). Our findings confirm and extend previous assessments of drd1a-EGFP and drd2-EGFP mice (Gong et al., 2003, 2007; Lee et al., 2006; Lobo et al., 2006). They validate these mice as useful animal models to study the cellular distribution of signaling molecules regulated in the striatum in vivo. Expression of D1R and D2R in MSNs in various striatal regions. A, DARPP-32 immunofluorescence (red) identifies MSNs, and EGFP fluorescence labels cells that express D1R (top) and D2R (bottom). B, Estimation of the proportion of MSNs that express D1R, D2R, or both in the dorsal striatum (DStr; top), NAc shell (Shell; middle), and NAc core (Core; bottom), assuming that all MSNs express at least one of these receptors. Percentages were calculated by adding the percentage of DARPP-32-positive MSNs that were EGFP-positive neurons in drd1a-EGFP and drd2-EGFP mice. Numbers above 100% were taken as an indication of coexpression. Quantifications were obtained from several images (238 × 238 μm) per region of two to eight mice of each genotype. The percentage of EGFP-positive neurons were as follows: DStr, 58 ± 5% in D1R-expressing neurons (D1+) and 48 ± 3% in D2R-expressing neurons (D2+); Shell, 71.5 ± 4.5% in D1+ and 53.6 ± 2.8% in D2+; Core, 59.8 ± 1.2% in D1+ and 46.5 ± 2% in D2+. C, Identification of cholinergic interneurons. ChAT (red) and DARPP-32 (blue) immunoreactivity and EGFP fluorescence (green) in drd1a-EGFP (top) and drd2-EGFP (bottom) mice. Arrowheads indicate the position of cholinergic interneurons. Single confocal sections are shown. Scale bars, 40 μm. After 3 d of 2 h habituation to the experimental apparatus and intraperitoneal injections (see Materials and Methods), drd1a- and drd2-EGFP mice were treated with cocaine (20 mg/kg) 1 h after their placement in the locomotor activity boxes. Locomotor activity was measured to verify the behavioral effects of cocaine (data not shown) and mice killed at various time points. We analyzed several regions of the striatum at different levels through the rostrocaudal axis (Fig. 4A). Double-fluorescence analysis of the striatum of mice perfused 15 min after cocaine injection revealed that ERK phosphorylation occurred exclusively in D1R-expressing neurons, whereas no staining was detected in D2R-expressing neurons (Fig. 4B). In the neuropil, analysis at a higher magnification showed colocalization of red and green fluorescence in drd1a-EGFP mice but not in drd2-EGFP mice (Fig. 4C). We counted p-ERK-immunoreactive neurons in the striatal regions (Fig. 4A) of drd1a-EGFP mice and classified them as D1R-positive (D1+) and D1R-negative (D1−) cells according to the coincidence with the EGFP signal (Fig. 4D–F). Basal ERK phosphorylation in control mice was almost exclusively detected in D1+ neurons in all cases (Fig. 4D–F). Cocaine-induced ERK activation in the dorsal striatum and in the NAc (shell and core) was also restricted to D1R-expressing MSNs in all analyzed areas (Fig. 4D–F). Quantification showed that this activation was similar in all regions of the dorsal striatum, including its dorsomedial and ventrolateral parts (Fig. 4D), as well as in more rostral and caudal areas (data not shown). Interestingly, analysis of the NAc showed less ERK activation in the caudal part (Fig. 4E,F). When a higher dose of cocaine was administered (30 mg/kg, 15 min), the same pattern of ERK activation restricted to D1R+ neurons was observed (supplemental Fig. 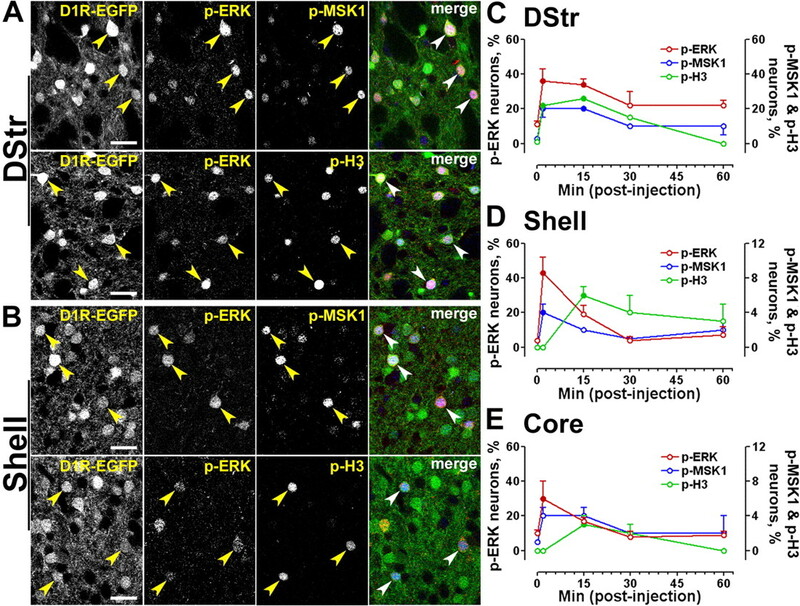 1A, available at www.jneurosci.org as supplemental material), although a higher number of cells were immunoreactive for p-ERK at this dose (supplemental Fig. 1B, available at www.jneurosci.org as supplemental material). Altogether, these results clearly showed that the ERK activation induced by cocaine administration occurred selectively in D1R-striatonigral MSNs in all striatal regions. ERK activation occurs exclusively in D1R-expressing striatal neurons after acute administration of cocaine. A, The position of the striatal regions used for quantifcation is indicated by red circles on mouse brain coronal sections at various bregma (B) coordinates along the rostrocaudal axis (Paxinos and Franklin, 2001). S, NAc shell; C, NAc core; DM, dorsomedial part of the dorsal striatum; VL, ventrolateral part of the dorsal striatum. B, p-ERK immunoreactivity (red) and EGFP fluorescence (green) in the dorsal striatum of drd1a- and drd2-EGFP mice 15 min after cocaine (20 mg/kg) administration. Arrowheads show p-ERK immunoreactivity in D1R-positive neurons (left) and excluded from D2R-positive neurons (right). C, Higher magnification showing colocalization of p-ERK (red) and EGFP (green) in the neuropil of drd1a-EGFP mice (left) and its absence in drd2-EGFP mice (right). Single confocal sections are shown. D, Quantification of striatal p-ERK-immunoreactive neurons among EGFP-positive (D1+) or EGFP-negative (D1−) neurons in drd1a-EGFP mice, 15 min after cocaine injection, in the DM and VL parts of the DStr. E, F, Same quantifications at various rostrocaudal coordinates (indicated in A) of the shell (E) and the core (F) of the NAc. Data (means ± SEM; n = 3–8 mice per group) were analyzed using two-way ANOVA (values in supplemental Table 1, available at www.jneurosci.org as supplemental material). *p < 0.05; **p < 0.01; ***p < 0.001, control (cont) versus cocaine (coc) (Bonferroni test). Scale bars: B, 40 μm; C, 10 μm. We next studied the cellular localization of the activation of putative downstream targets of the ERK pathway in response to cocaine. We focused our attention on MSK1 and histone H3. MSK1 is directly activated by ERK through phosphorylation of Thr-581 and Ser-360 (McCoy et al., 2005) and is critical for the phosphorylation of CREB in the striatum in response to cocaine (Brami-Cherrier et al., 2005). Phosphorylation of histone H3 on Ser-10 is also strongly increased after cocaine administration in an ERK-dependent manner (Brami-Cherrier et al., 2005; Kumar et al., 2005). Double-fluorescence analysis revealed p-MSK1 immunoreactivity only in D1R-expressing neurons 15 min after cocaine administration, whereas the same analysis in drd2-EGFP mice showed its exclusion from D2R-expressing cells (Fig. 5A). Quantification in cocaine-treated drd1a-EGFP mice showed a significant increase in p-MSK1-immunopositive D1R-EGFP neurons in all striatal regions (Fig. 5B). Similar observations were made when we studied p-H3 immunoreactivity (Fig. 5C,D). 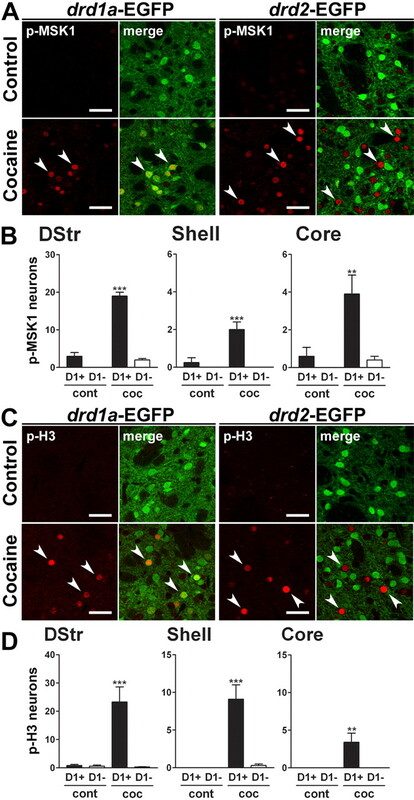 These results strongly indicate that the ERK signaling cascade in response to acute cocaine is specifically activated in D1R-expressing neurons of the striatum. Acute cocaine induces MSK1 and histone H3 phosphorylation only in D1R-expressing striatal neurons. A, C, p-MSK1 (A, red) or p-H3 (C, red) immunofluorescence and EGFP fluorescence (green) in the dorsal striatum of drd1a- and drd2-EGFP mice, 15 min after cocaine treatment. Arrowheads show p-MSK1 (A) and p-H3 (C) immunoreactivity in D1R-positive neurons (left) and excluded from D2R-positive neurons (right). Single confocal sections are shown. Scale bars, 40 μm. B, D, Quantification of striatal p-MSK1-immunoreactive (B) and p-H3-immunoreactive (D) neurons among EGFP-positive (D1+) or EGFP-negative (D1−) neurons in drd1a-EGFP mice, 15 min after cocaine injection in various striatal regions (dorsal striatum, NAc). Data (means ± SEM; n = 4–8 mice per group) were analyzed using two-way ANOVA (values in supplemental Table 2, available at www.jneurosci.org as supplemental material). **p < 0.01; ***p < 0.001, control versus cocaine (Bonferroni test). DStr, Dorsal striatum; cont, control; coc, cocaine. We examined whether phosphorylation of ERK, MSK1, and histone H3 could be detected in the same D1R-containing striatal neurons. 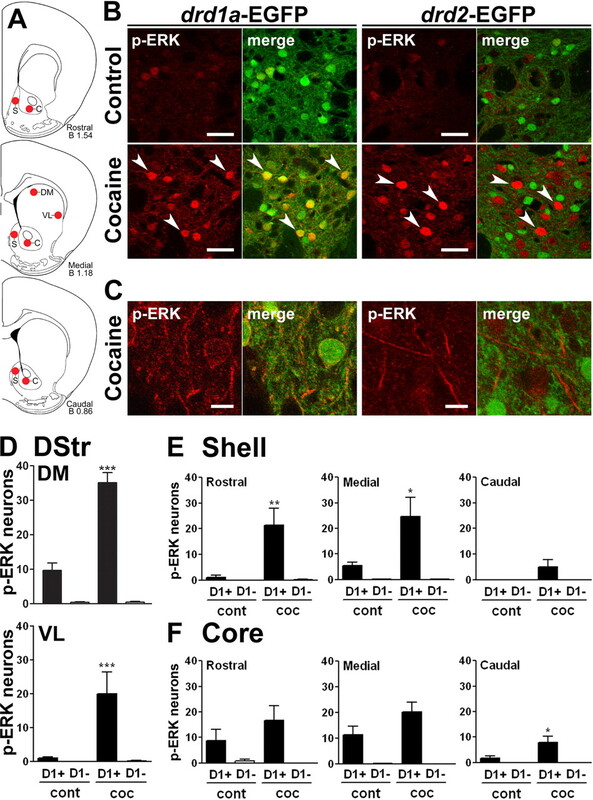 Double immunolabeling of p-ERK and p-MSK1 in D1R-EGFP mice showed almost complete triple colocalization in the dorsal striatum and the shell of the NAc 15 min after cocaine treatment (Fig. 6A,B, top panels). Equivalent results were obtained when the same analysis was done using p-H3-specific antibodies (Fig. 6A,B, bottom panels). However, although virtually all p-MSK1 or p-H3 neurons showed p-ERK immunoreactivity, single-labeled p-ERK neurons were easily detectable in all striatal regions (data not shown). These results showed that p-MSK1 and p-H3 increased in a subset of the striatonigral neurons in which ERK phosphorylation was induced in response to acute cocaine, supporting the proposal of a causal relationship between these effects. Time course of ERK, MSK1, and histone H3 phosphorylation in D1R-striatonigral neurons after a single exposure to cocaine. A, B, EGFP fluorescence (green), p-ERK immunofluorescence (red), and p-MSK1 (blue, top) or p-H3 (blue, bottom) immunofluorescence in the dorsal striatum (DStr; A) and the NAc shell (B) of drd1a-EGFP mice. Arrowheads point to D1R-positive neurons that contain both p-ERK and p-MSK1 or p-H3. Photographs are single confocal sections. Scale bars, 40 μm. C–E, Percentage of EGFP-positive neurons immunoreactive for p-ERK (red, left y-axis), p-MSK1 (blue, right y-axis), and p-H3 (green, right y-axis) at various times after cocaine injection in drd1a-EGFP mice, in a different set of experiments from those in A and B: dorsal striatum (C), NAc shell (Shell; D), and NAc core (Core; E). Data (means ± SEM; n = 3–4 mice per group) were analyzed using one-way ANOVA (values in supplemental Table 3, available at www.jneurosci.org as supplemental material). Filled circles, p < 0.05, groups 2–60 min versus 0 min (Dunnett's multiple test); open circles, not significant. We next compared the kinetics of phosphorylation of ERK, MSK1, and H3 triggered by cocaine in D1R-expressing neurons in various regions of the striatum. The time-course analysis after cocaine injection revealed that the variations of the percentage of D1R-expressing cells immunoreactive for each phosphoprotein differed from one striatal area to the other (Fig. 6C–E). Phosphorylated ERK was the highest 2 min after cocaine injection in all regions, but its increase was more prolonged in the dorsal striatum (Fig. 6C) than in the NAc shell and core (Fig. 6D,E). MSK1 phosphorylation had a similar time course (Fig. 6C–E), whereas H3 phosphorylation was delayed, being maximal at 15 min in all three striatal regions (Fig. 6C–E). Interestingly, no p-H3-positive neuron was detected in the NAc 2 min after cocaine administration (Fig. 6D,E). Phosphorylation of ERK, MSK1, and H3 decreased markedly between 15 and 30 min after cocaine treatment, showing that it is a transient process. At t = 30 min and t = 60 min, the numbers of immunopositive neurons were not significantly different from those observed at t = 0 (Fig. 6C–E). It is worth noting that at all time points after injection, <50% of D1R-expressing neurons were positive for p-ERK, p-MSK1, or p-H3. This suggests that the activation of the D1R-striatonigral system is far from being saturated in this condition. Interestingly, the number of p-MSK1- and p-H3-positive neurons was only slightly lower than the number of p-ERK-positive neurons in the dorsal striatum (Fig. 6C), whereas it was 5- to 10-fold lower in the NAc core and shell (Fig. 6D,E, compare left and right scales). This observation strongly suggests that the phosphorylation of MSK1 and H3 occurs only in a subset of the neurons in which ERK is activated, indicating that these targets may require an additional signal(s) and/or a high threshold of ERK activation, not identifiable by immunofluorescence. Expression of c-Fos and Zif268 induced by psychostimulant drugs administered in the home cage or non-novel environments has been studied extensively and shown to depend on D1R stimulation (Graybiel et al., 1990; Moratalla et al., 1992, 1993; Hope et al., 1994; Robertson and Jian, 1995; Wang and McGinty, 1995). After acute administration of cocaine, transient induction in the striatum of IEGs such as c-fos and zif268 (also termed egr-1, krox24, or NGFI-A) has been proposed to play a role in long-term neuronal alterations (Graybiel et al., 1990; Rosen et al., 1994; Moratalla et al., 1996; Berke and Hyman, 2000; Valjent et al., 2006b). In our study, in which animals were habituated for 3 d to the test apparatus and injections, we examined in which specific neuronal subpopulations these IEGs were induced after acute cocaine administration (Fig. 7). c-Fos and Zif268 expression was increased in a time-dependent manner 30 and 60 min after administration of 20 mg/kg cocaine in the various regions of the striatum. Interestingly, although most of the c-Fos- and Zif268-immunoreactive cells were D1R-expressing neurons, some of them were also D2R-positive neurons (Fig. 7). This slight induction in D2R-expressing MSNs was surprising, because cocaine- or amphetamine-induced striatal c-Fos and Zif268 expression is markedly reduced by pharmacological inhibition of MAPK/ERK kinase (MEK), the enzyme that activates ERK (Valjent et al., 2000, 2006b; Ferguson and Robinson, 2004; Zhang et al., 2004; Radwanska et al., 2006). One possible explanation could be that the induction of c-fos and zif268 in D2R neurons is independent of ERK and that the selectivity of MEK inhibitors is limited. Alternatively, a low level of activation of ERK, below the threshold for immunofluorescence detection, could be sufficient for IEG induction. Finally, ERK in other neurons may indirectly control gene expression in D2R neurons through paracrine or circuit-level effects. 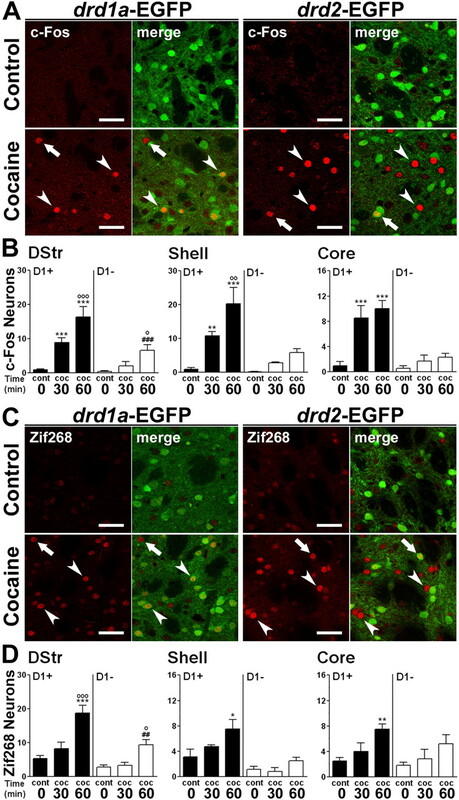 Acute cocaine exposure induces IEG expression in striatal D1R-expressing neurons and, to a lesser extent, in D2R-expressing neurons. A, C, Fluorescence of EGFP (green) and c-Fos (A) or Zif268 (C) immunoreactivity (red) in the dorsal striatum of drd1a- and drd2-EGFP mice 60 min after cocaine administration. Arrowheads indicate c-Fos (A) and Zif268 (C) expressed in D1R-expressing neurons in both strains of BAC transgenic mice. Arrows indicate c-Fos (A) and Zif268 (C) expressed in D2R-expressing neurons. Single confocal sections are shown. Scale bars, 40 μm. B, D, Quantification of c-Fos-immunoreactive (B) and Zif268-immunoreactive (D) neurons among EGFP-positive (D1+) and EGFP-negative (D1−) neurons in drd1a-EGFP mice 30 and 60 min after acute cocaine treatment in the dorsal striatum (DStr) and in the NAc shell and core. Data (means ± SEM; n = 4–8 mice per group) were analyzed using two-way ANOVA (values in supplemental Table 4, available at www.jneurosci.org as supplemental material). *p < 0.05, **p < 0.01, ***p < 0.001, group cont 0 versus groups coc 30 and coc 60 (D1+); ##p < 0.01, ###p < 0.001, group cont 0 versus groups coc 30 and coc 60 (D1−); ∘p < 0.05, ∘∘p < 0.01, ∘∘∘p < 0.001, group coc 30 versus coc 60 (Bonferroni test). cont 0, Control (0 min cocaine); coc 30, cocaine (30 min); coc 60, cocaine (60 min). We investigated whether repeated cocaine exposure led to a different neuronal distribution of activation of signaling pathways compared with a single injection. To verify the response of mice to repeated injections, we measured locomotor activity after each injection. After 2 d of habituation to the locomotor activity chambers before the onset of the repeated cocaine administration regimen (see Materials and Methods), mice received cocaine (20 mg/kg) for 5 consecutive days and were challenged with saline or cocaine after a 6 d withdrawal period. They were compared with a group of mice repeatedly treated with saline and challenged with saline or cocaine. Results in this latter group were virtually identical to those of the mice acutely treated with cocaine, as reported above. Mice pretreated with cocaine displayed a strong locomotor sensitization, because the drug-specific response after repeated cocaine was 257% of the acute response. Animals were perfused 15 or 60 min after the challenge injection. Immunofluorescence analysis revealed that the number of p-ERK-positive neurons in the dorsal striatum was significantly higher after repeated injections than after a single injection of cocaine (Fig. 8A,B). ERK activation levels did not change in the other striatal regions. 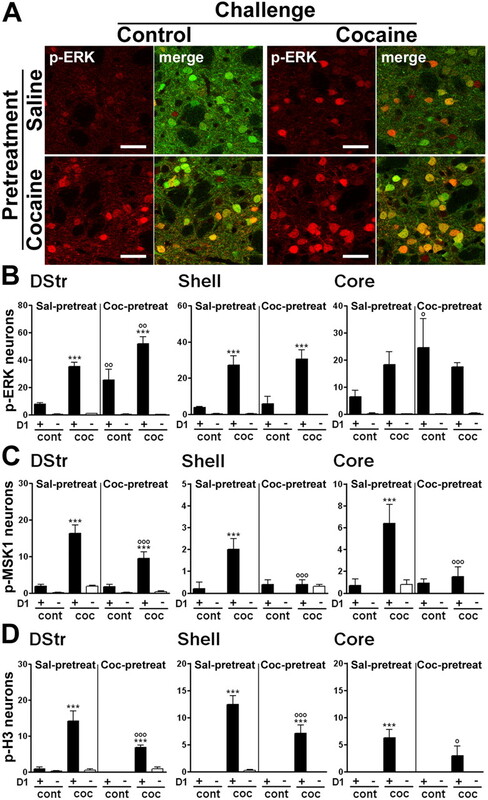 Interestingly, compared with saline-pretreated mice, a higher number of p-ERK-positive neurons was observed in the dorsal striatum and the NAc core of animals chronically treated with cocaine and challenged with saline (Fig. 8A,B), suggesting the existence of a “conditioned” ERK activation. However, in all cases, p-ERK immunoreactivity was exclusively detected in D1R neurons (Fig. 8A,B). In contrast, the ability of cocaine to induce MSK1 and histone H3 phosphorylation was strongly decreased after chronic cocaine treatment in all striatal regions (Fig. 8C,D). As in acutely treated mice, this phosphorylation was detected only in D1R-expressing neurons. A cocaine challenge in mice previously exposed to this drug activates ERK, MSK1, and H3 phosphorylation exclusively in D1R-expressing neurons. Mice received a pretreatment with saline or cocaine and, after a 6 d withdrawal, a challenge injection of saline or cocaine (20 mg/kg). A, Fluorescence of p-ERK immunoreactivity (red) and EGFP (green) in the dorsal striatum, 15 min after a challenge injection of saline (control, left) or cocaine (right) in saline-pretreated (Sal-pretreat; top) or cocaine-pretreated (Coc-pretreat; bottom) drd1a-EGFP mice. Single confocal sections are shown. Scale bars, 40 μm. 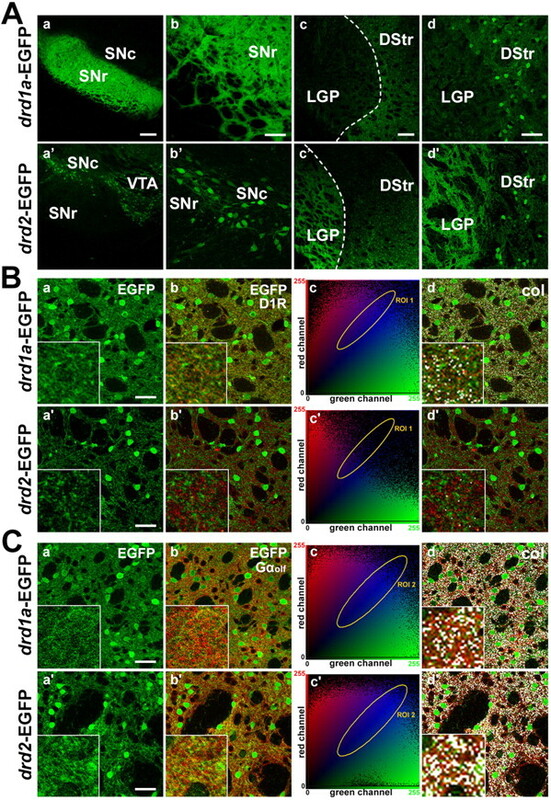 B–D, Quantification of p-ERK-immunoreactive (B), p-MSK1-immunoreactive (C), and p-H3-immunoreactive (D) neurons among EGFP-positive (D1+) or EGFP-negative (D1−) neurons in various striatal regions of drd1a-EGFP mice treated as in A. In the dorsal striatum (DStr) and NAc core of cocaine-pretreated mice, saline injection (cont) increased the number of p-ERK-positive neurons. In the dorsal striatum of cocaine-pretreated mice, cocaine injection (coc) induced more p-ERK-positive neurons than in saline-pretreated mice. Data (means ± SEM; n = 4–7 mice per group) were analyzed using three-way ANOVA (values in supplemental Table 5, available at www.jneurosci.org as supplemental material). ***p < 0.001, cont vs coc; ∘p < 0.05, ∘∘p < 0.01, ∘∘∘p < 0.001, saline-pretreated versus cocaine-pretreated (Bonferroni test). ∘∘∘p < 0.001, saline-pretreated versus cocaine-pretreated (Bonferroni test). It has been shown that after chronic cocaine treatment, c-Fos and Zif268 expression returns to basal levels and does not significantly increase after an additional acute challenge with cocaine, suggesting that the ability of cocaine to induce these IEGs undergoes desensitization (Hope et al., 1992). The number of c-Fos-positive cells in all striatal regions was lower in chronically treated mice than after an acute injection, and the induction was significant only in D1R-positive neurons (Fig. 9A). Similarly, less induction of zif268 was observed in the dorsal striatum compared with the effects of acute cocaine (Figs. 7D, 9B). Moreover, as reported recently (Valjent et al., 2006b), zif268 was not induced in the NAc in cocaine-pretreated mice (compare Fig. 9B with Fig. 7D). c-fos and zif268 were not significantly induced in D2R-expressing neurons of chronically treated animals (Fig. 9). c-fos and zif268 induction by a cocaine challenge in mice previously exposed to this drug is decreased and restricted to D1R-expressing neurons. Mice received five daily cocaine injections and, after a 6 d withdrawal, a challenge injection of saline (cont) or cocaine (coc). Quantification of c-Fos-immunoreactive (A) and Zif268-immunoreactive (B) neurons among EGFP-positive (D1+) and EGFP-negative (D1−) neurons in drd1a-EGFP mice 60 min after a challenge injection of saline (cont) or cocaine (coc) in cocaine-pretreated drd1a-EGFP mice is shown. Data (means ± SEM; n = 3 mice per group) were analyzed using two-way ANOVA (values in supplemental Table 6, available at www.jneurosci.org as supplemental material). *p < 0.05, **p < 0.01, ***p < 0.001, group control versus cocaine (Bonferroni test). Altogether, these results indicate that, with the marked exception of the upregulated ERK phosphorylation in the dorsal striatum, the investigated signaling pathways were desensitized in animals repeatedly exposed to cocaine. Importantly, the activation of these pathways occurred almost exclusively in D1R-expressing neurons of the striatum. Our results after single and repeated cocaine treatments revealed a strong selectivity of ERK pathway activation in D1R-expressing striatal neurons. To test whether it was also possible to activate the ERK pathway in D2R-striatopallidal neurons, we used the antipsychotic haloperidol, a nonselective D2R antagonist reported to induce c-Fos expression in striatopallidal neurons (Robertson et al., 1992). Haloperidol is able to activate ERK phosphorylation in the striatum (Pozzi et al., 2003; Valjent et al., 2004), although the precise neurons in which this activation occurs are not known. We first examined the effects of haloperidol in drd1a-EGFP mice. Fifteen minutes after a single injection of haloperidol (0.5 and 1 mg/kg), p-ERK immunoreactivity was increased in the dorsal striatum in neurons that did not express EGFP under the control of D1R promoter (Fig. 10A,B and supplemental Fig. 1C,D, available at www.jneurosci.org as supplemental material). The same pattern was observed when we studied p-MSK1 or p-H3 immunoreactivity (Fig. 10A,B). One hour after haloperidol injection, c-Fos was detected only in neurons that did not express D1R (Fig. 10C,D). Zif268 was increased in both types of neurons, although the largest number of Zif268-positive neurons was D1R negative (Fig. 10C,D). These observations were confirmed when we used drd2-EGFP mice, in which there was a clear colocalization of EGFP and p-ERK, p-MSK1, p-H3, and c-Fos immunoreactivities, whereas Zif268 was found mostly in EGFP-positive, but also in some EGFP-negative, neurons (Fig. 10E). Quantification in drd2-EGFP mice revealed similar increases in immunoreactivity in the two neuronal populations compared with those recorded in drd1a-EGFP mice (Fig. 10F, compare B, D). Haloperidol induces ERK, MSK1, and H3 phosphorylation, as well as c-Fos and Zif268 expression, in D2R-expressing striatal neurons. drd1a- and drd2-EGFP mice were injected [haloperidol (halo)] or not [control (cont)] with 0.5 mg/kg haloperidol and perfused after 15 min (A, B) or 60 min (C, D). A, C, Immunofluorescence (red) of p-ERK, p-MSK1, p-H3, c-Fos, and Zif268 alone or in combination with EGFP fluorescence (green, merge) in the dorsal striatum of drd1a-EGFP mice. B, D, The number of immunoreactive neurons was quantified for each marker among EGFP-positive (D1+) and EGFP-negative (D1−) neurons. E, F, Similar experiments were performed in drd2-EGFP mice, E, Immunofluorescence of p-ERK, p-MSK1, p-H3, c-Fos, and Zif268 (red) alone or in combination with EGFP fluorescence (green, merge) in the dorsal striatum of drd2-EGFP mice after haloperidol administration. F, The number of immunoreactive neurons for each marker in the absence (D2−) or presence (D2+) of EGFP fluorescence in the dorsal striatum of drd2-EGFP mice 15 min (p-ERK, p-MSK1, p-H3) and 60 min (c-Fos, Zif268) after haloperidol injection. Data (means ± SEM; n = 3–8 mice per group) were analyzed using two-way ANOVA (values in supplemental Table 7, available at www.jneurosci.org as supplemental material). *p < 0.05, ***p < 0.001 cont versus halo (D1+/D2−); ##p < 0.01, ###p < 0.001 cont versus halo (D1−/D2+) (Bonferroni test). Single confocal sections are shown. Scale bars, 40 μm. Although the same molecular responses induced by cocaine in striatonigral neurons were triggered by haloperidol in striatopallidal neurons, interesting quantitative differences were observed. The proportion of p-H3-immunoreactive nuclei relative to p-ERK-positive neurons was higher in haloperidol-treated mice compared with cocaine-treated mice (compare Fig. 10 with Figs. 4, 5). The ratio of the numbers of p-H3-positive/p-MSK1-positive neurons in response to haloperidol was approximately twofold higher than that observed in response to cocaine (compare Figs. 10B and 5B,D). In addition, haloperidol-induced ERK phosphorylation in striatal neurons was almost absent in the dorsolateral part of the dorsal striatum (supplemental Fig. 2A,B, available at www.jneurosci.org as supplemental material), whereas a high number of p-H3-immunoreactive neurons was observed in this region on adjacent sections (supplemental Fig. 2C,D, available at www.jneurosci.org as supplemental material). These observations suggest that phosphorylation of ERK, MSK1, and H3 induced by haloperidol in striatopallidal neurons are not causally related, in contrast to what we described above for cocaine. Altogether, our results demonstrate that haloperidol selectively activates the phosphorylation of several important signaling proteins in D2R-expressing neurons of the dorsal striatum, providing evidence that these pathways are perfectly functional in D2R neurons. Interestingly, they suggest that the relationships between these signaling proteins are different from that characterized in D1R neurons. In the present study, we analyzed the populations of striatal neurons in which two drugs with completely different modes of action, cocaine and haloperidol, activate similar signaling pathways, using drd1a-EGFP and drd2-EGFP transgenic mice (Gong et al., 2003). We first characterized in detail the distribution of EGFP in these mice, and, extending previous results (Gong et al., 2003; Lee et al., 2006; Lobo et al., 2006), we showed the selective expression of D1R and D2R promoters in striatonigral and striatopallidal MSNs, respectively. The selectivity of the BAC expression system is also supported by the study of similar transgenes driving Cre expression (Gong et al., 2007). Our functional results of pharmacological stimulation also supported the clear segregation between the two populations of MSNs, showing the selective activation of ERK and some of its putative downstream effectors by cocaine and an antipsychotic, haloperidol, in D1R and D2R neurons, respectively. Cocaine-induced phosphorylation of ERK and of two of its targets, MSK1 and histone H3 (Brami-Cherrier et al., 2005), was restricted to D1R-expressing MSNs in the dorsal striatum and NAc core and shell. These results extend previous immunofluorescence studies that identified MSN populations in which ERK was activated using dynorphin, enkephalin, or D1R immunoreactivities (Zhang et al., 2004; Valjent et al., 2005). The phosphorylation of ERK and MSK1 was transient and preceded the phosphorylation of H3, and all events occurred in the same striatonigral neurons. This is in agreement with the proposal of a causal relationship between these signaling events in response to cocaine, based on the use of inhibitors of ERK activation and MSK1 mutant mice (Brami-Cherrier et al., 2005). The causal relationship of ERK with c-fos and zif268 induction, however, appears less complete because this induction was also detected in some D2R neurons. Repeated injections of psychostimulant drugs induce a pronounced sensitization of locomotor responses. The ERK pathway, but not the cAMP-dependent protein kinase pathway, appears to be sensitized after repeated exposure to cocaine or amphetamine (Valjent et al., 2000; Mattson et al., 2005; Shi and McGinty, 2007). Our study provides evidence for an increased activation of ERK in the dorsal striatum. It also shows that ERK activation remained restricted to D1R-expressing neurons. In contrast, we observed a profound downregulation of the phosphorylation of MSK1 and H3. This may account for the decreased induction of c-fos and zif268 after repeated cocaine administration observed here, in agreement with previous reports in which the drugs were injected in the home cage or in environments to which animals were previously habituated (Hope et al., 1992, 1994; Wang and McGinty, 1995; Kumar et al., 2005). However, our results contrast with studies in which psychostimulants were administered to rats in a novel environment, because in this condition, c-fos induction in the NAc was enhanced rather than decreased (Crombag et al., 2002; Hope et al., 2006). A possible explanation for this difference is that a previous habituation to the experimental context before the onset of the repeated drug administration regimen was sufficient to reduce the stress induced by novelty, which has been shown to strongly influence psychostimulant effects on DA neurotransmission (Badiani et al., 1999; Uslaner et al., 2001; Ferguson et al., 2003). Moreover, reexposure of mice to the context repeatedly associated with cocaine induced by itself a strong ERK activation in striatonigral MSNs of the dorsal striatum and NAc core (Fig. 8), as reported previously in animals trained for conditioned place preference with cocaine or methamphetamine (Mizoguchi et al., 2004; Miller and Marshall, 2005; Valjent et al., 2006a). However, it must be underlined that, in our study, contextual reexposure was not followed by increased MSK1 or histone H3 phosphorylation. The contrast between increased ERK activation and decreased downstream responses in mice repeatedly treated with cocaine is particularly interesting, because it suggests the existence of specific control mechanisms at the level of nuclear phosphoproteins, such as the activation of nuclear phosphatases. In combination with the effects of cocaine, the results obtained with haloperidol provide important clues concerning the regulation of ERK in the striatum. The pharmacological blockade of D2R by haloperidol, eticlopride, or raclopride is known to activate ERK in striatal neurons (Pozzi et al., 2003; Valjent et al., 2004; Westin et al., 2007) and in DA terminals (Hakansson et al., 2004). However, the precise localization of this activation was not identified (Pozzi et al., 2003; Valjent et al., 2004; Westin et al., 2007). Here we show that, in contrast to cocaine, haloperidol-induced ERK activation was only observed in D2R neurons. MSK1 and histone H3 phosphorylation also occurred exclusively in these neurons. However, in contrast to cocaine, several lines of evidence suggest that these molecules may not be functionally linked in response to haloperidol. In fact, the ratio pH3-positive/pMSK1-positive neurons was higher in haloperidol-treated than in cocaine-treated mice, and a strong phosphorylation of H3 was observed in the dorsolateral striatum, a region where ERK activation was virtually absent (supplemental Fig. 2, available at www.jneurosci.org as supplemental material). This suggests differences in signaling pathways in response to haloperidol compared with those activated by cocaine, which will require further investigation. The mechanism by which haloperidol or selective D2 antagonists exert their action on ERK is not known. The pronounced effects exerted by antagonists strongly indicate that DA has a basal inhibitory effect on the ERK pathway in D2R-expressing neurons. This observation has two important implications. First, it provides direct evidence for the hypothesis that basal levels of DA can tonically stimulate high-affinity D2R (Richfield et al., 1989). Second, it implies that D2R inhibits the ERK pathway in the striatum, as it does in pituitary cells (Liu et al., 2002). In support of this hypothesis, careful analysis performed in untreated and both acutely and chronically cocaine-treated mice revealed that phosphorylation of ERK, MSK1, and histone H3 was always excluded from D2R neurons, even in control animals (Figs. 4, 5). Because there is a likely coexpression of D1R and D2R in a significant percentage of MSNs (5–6% in the dorsal striatum and NAc core, 17% in the NAc shell), the apparently complete lack of ERK pathway activation in D2R neurons suggests that D2R may have an inhibitory effect on this pathway. Moreover, because the stimulation of corticostriatal projections activates ERK phosphorylation in D2R striatal neurons (Sgambato et al., 1998; Gerfen et al., 2002; Quiroz et al., 2006), results obtained in this study suggest that a basal DA tone could be repressing ERK activation in striatopallidal MSNs through D2R stimulation, which might act by opposing the action of glutamate and A2a receptors. Additional studies are necessary to explore this possibility. The functional implications of our findings are important to consider. Our results demonstrate the existence of a complete segregation between the striatonigral and striatopallidal circuits within the striatum in response to pharmacological stimuli. Although this distinction was proposed many years ago on the basis of gene expression patterns, it had never been clearly demonstrated in terms of signal transduction pathways. Such a dramatic segregation between the two populations of MSNs is in agreement with recent electrophysiological findings, which revealed that striatopallidal MSNs display several forms of plasticity that are absent in striatonigral MSNs (Day et al., 2006; Kreitzer and Malenka, 2007; Shen et al., 2007). Because the ERK pathway appears to be important for the long-lasting behavioral alterations induced by cocaine, our results point to a selective involvement of this pathway in the regulation of cocaine effects in D1R neurons, in agreement with our previous suggestions (Girault et al., 2007). On the other hand, the physiological significance of the effects of antipsychotics is unclear, although it supports a tonic inhibitory role of DA on ERK and other signaling events in D2R neurons. One of the few instances in which extracellular DA may decrease is the lack of occurrence of an expected reward (Schultz et al., 1997). Further studies will address whether this decrease may regulate ERK and exert long-term effects in striatopallidal neurons. Our study highlights the importance to clearly identify the specific cell types and neuronal circuits in which a given signaling pathway is activated in response to drugs. This information is necessary for a correct interpretation of the long-lasting effects of drugs of abuse and other psychoactive compounds. BAC-EGFP transgenic mice therefore represent a remarkable tool that opens a new dimension for analysis of functional signaling in vivo. This work was supported by Inserm and by a grant from Agence Nationale de la Recherche (ANR-05-NEUR-020). J.B.-G. was supported by a grant from Fondation pour la Recherche Médicale. We are grateful to R. R. Luedtke (University of North Texas Health Science Center at Fort Worth, Fort Worth, TX), P. Gaspar (Institut du Fer à Moulin), and P. Greengard (Rockefeller University, New York, NY) for gifts of antibodies and to N. Heintz and P. Greengard for providing the transgenic mice used in this study. We thank Theano Irinopoulou for comments on the immunofluorescence analysis and Aline Betems, Philippe Bernard, Natacha Roblot, and Alice Rousseau for animal care, breeding, and genotyping. (2004) Amphetamine-evoked gene expression in striatopallidal neurons: regulation by corticostriatal afferents and the ERK/MAPK signaling cascade. J Neurochem 91:337–348. (2003) Amphetamine-evoked c-fos mRNA expression in the caudate-putamen: the effects of DA and NMDA receptor antagonists vary as a function of neuronal phenotype and environmental context. J Neurochem 86:33–44. (1992) Molecular cloning of the rat A2 adenosine receptor: selective co-expression with D2 dopamine receptors in rat striatum. Brain Res Mol Brain Res 14:186–195. (1990) Amphetamine and cocaine induce drug-specific activation of the c-fos gene in striosome-matrix compartments and limbic subdivisions of the striatum. Proc Natl Acad Sci USA 87:6912–6916. (2003) The basal ganglia and motor control. Neural Plast 10:107–120. (2004) Computational models of the basal ganglia: from robots to membranes. Trends Neurosci 27:453–459. (2004) Regulation of striatal tyrosine hydroxylase phosphorylation by acute and chronic haloperidol. Eur J Neurosci 20:1108–1112. (2001) Gα(olf) levels are regulated by receptor usage and control dopamine and adenosine action in the striatum. J Neurosci 21:4390–4399. (1992) Regulation of immediate early gene expression and AP-1 binding in the rat nucleus accumbens by chronic cocaine. Proc Natl Acad Sci USA 89:5764–5768. (2002) Activation of Go-coupled dopamine D2 receptors inhibits ERK1/ERK2 in pituitary cells. A key step in the transcriptional suppression of the prolactin gene. J Biol Chem 277:35819–35825. (2005) Cocaine-induced CREB phosphorylation in nucleus accumbens of cocaine-sensitized rats is enabled by enhanced activation of extracellular signal-related kinase, but not protein kinase A. J Neurochem 95:1481–1494. (2005) MSK1 activity is controlled by multiple phosphorylation sites. Biochem J 387:507–517. (2004) Regulations of methamphetamine reward by extracellular signal-regulated kinase 1/2/ets-like gene-1 signaling pathway via the activation of dopamine receptors. Mol Pharmacol 65:1293–1301. (1992) Dynamic regulation of NGFI-A (zif268, egr1) gene expression in the striatum. J Neurosci 12:2609–2622. (1993) Coordinate expression of c-fos and jun B is induced in the rat striatum by cocaine. J Neurosci 13:423–433. (1984) DARPP-32, a dopamine- and adenosine 3′:5′-monophosphate-regulated phosphoprotein enriched in dopamine-innervated brain regions. III. Immunocytochemical localization. J Neurosci 4:111–124. (2001) The mouse brain in stereotaxic coordinates (Elsevier, San Diego), Ed 2. (2006) Blockade of adenosine A2A receptors prevents protein phosphorylation in the striatum induced by cortical stimulation. J Neurosci 26:10808–10812. (2006) Regulation of cocaine-induced activator protein 1 transcription factors by the extracellular signal-regulated kinase pathway. Neuroscience 137:253–264. 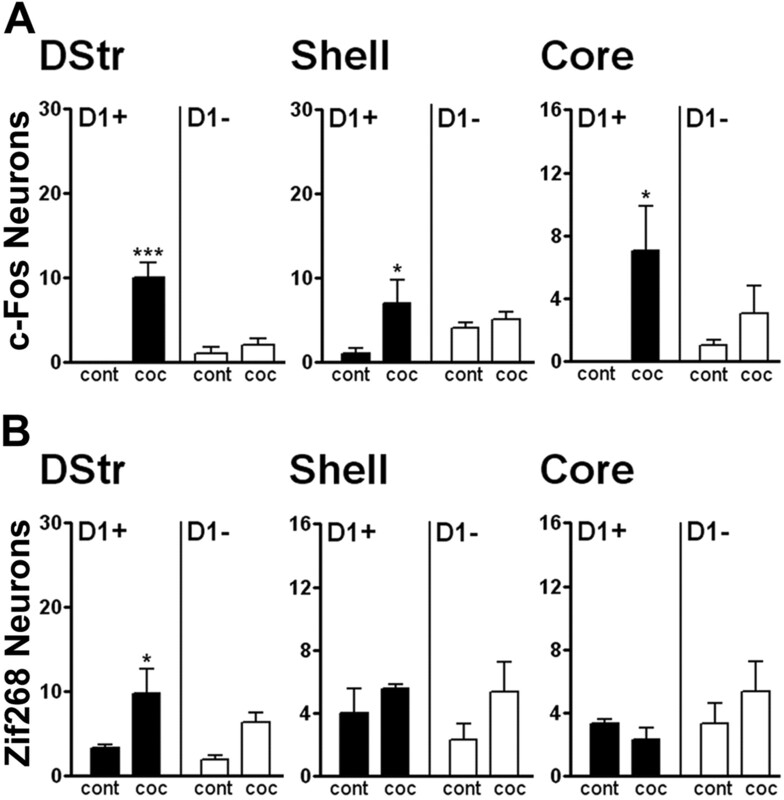 (1992) D1 and D2 dopamine receptors differentially regulate c-fos expression in striatonigral and striatopallidal neurons. Neuroscience 49:285–296. (1994) Differential induction of Fos protein and a Fos-related antigen following acute and repeated cocaine administration. Brain Res Mol Brain Res 25:168–172. (2006) Analysis of transcriptional responses in the mouse dorsal striatum following acute 3,4-methylenedioxymethamphetamine (ecstasy): identification of extracellular signal-regulated kinase-controlled genes. Neuroscience 137:473–482. (2007) Repeated amphetamine treatment increases phosphorylation of extracellular signal-regulated kinase, protein kinase B, and cyclase response element-binding protein in the rat striatum. J Neurochem 103:706–713. (2001) Amphetamine and cocaine induce different patterns of c-fos mRNA expression in the striatum and subthalamic nucleus depending on environmental context. Eur J Neurosci 13:1977–1983. (2006a) Inhibition of ERK pathway or protein synthesis during reexposure to drugs of abuse erases previously learned place preference. Proc Natl Acad Sci USA 103:2932–2937. (2006b) Plasticity-associated gene Krox24/Zif268 is required for long-lasting behavioral effects of cocaine. J Neurosci 26:4956–4960. (1995) Dose-dependent alteration in zif/268 and preprodynorphin mRNA expression induced by amphetamine or methamphetamine in rat forebrain. J Pharmacol Exp Ther 273:909–917. (2004) Cocaine-induced intracellular signaling and gene expression are oppositely regulated by the dopamine D1 and D3 receptors. J Neurosci 24:3344–3354.